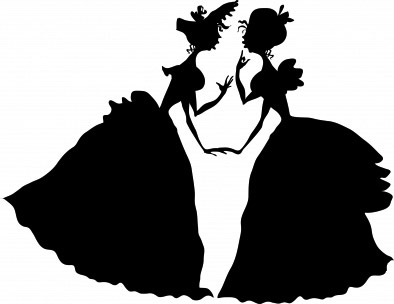 "Every wearer of the skeleton hoop skirt has experienced, more or less, inconvenience and danger from the hoops catching in everything that comes in their way — entangling the feet in ascending stairs, the stops of a bus, etc. — and have still continued to patronize the hoop skirt, because it was so troublesome to remove and replace the hoops of the muslin skirts for the purpose of washing." "The "Douglas & Sherwood Matinee Hoop Skirt," made of fine muslin, with eleven hoops and the Adjustable Bustle, combines all the advantages of the former muslin and skeleton skirts, with this great additional one, that by means of the Patent Detachable Hoop Fastening, the hoops of the hoop skirt can be removed and replaced instantly and easily. The muslin skirt will cost no more for washing than an ordinary over skirt, and the cut of the garment will insure its graceful set on the person. The band down the front is stitched on one side and hooked on the other, covering the Patent Detachable Fastening." To Remove the Hoops of the Hoop Skirt — "Unhook the band down the front of the hoop skirt and detach each hoop by turning up the small wire catch and drawing it out, by which the hoops can be taken from the slide. 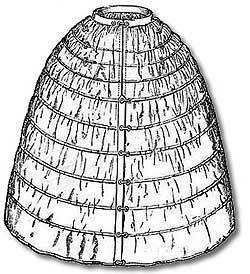 When all the fastenings are thus detached, lay the hoop skirt flat on a table and withdraw the hoops." To Replace the Hoops of the Hoop Skirt — "Again lay the muslin flat on the table, and run in all the hoops. After which, fasten each by slipping one end into the slide, and then the other over it, each end being flush with one extremity of the slide. When the small holes through which the catch is to go will form a tube, in which insert the catch and turn it down, so that it lies along the edged centre of the slide. Draw the fullness of the muslin evenly over the hoops; and to do this, it may be necessary to have the hoop skirt on a hook, so that it may readily be turned around. The hoops of the Adjustable Bustle and the cord at the bottom are not to be removed for washing." To Adjust the Patent Bustle of the Hoop Skirt — "The lacings go at the back of the person, and by drawing or slackening them, the size is increased or diminished. It is advisable to adjust the Bustle, and properly secure the lace when the hoop skirt is first worn, regard being first had to the spring of the basque, as nothing looks worse than to see the basque lie light over the skirts. For wet weather, however, it is a good plan to increase the size of the Bustle, the better to keep the skirts out of the mud."